During our 20+ years in business, we have worked on more than 3,000 sites providing Geoprobe® Direct Push and commercial environmental field sampling services to Environmental Engineering Companies and Consultants. We provide Geoprobe® soil, groundwater, and soil gas direct push drilling sampling services to Georgia, Alabama, Tennessee, Mississippi, Florida, Louisiana, North Carolina and South Carolina. We conduct soil gas/soil vapor sampling utilizing the Geoprobe® Post Run Tubing method; installing vapor implants, and by utilizing vapor pins for sub slab soil gas sampling. We can leak test most sampling points utilizing a variety of methods. The post run tubing method utilizes Geoprobe® Direct Push rods to install the vapor point. The method we employ to install vapor points involves advancing a Geoprobe® 1.25 inch probe rod equipped with a Post Run Tubing (PRT) holder and expendable point to the target depth. Once at the target depth, the expendable point on the bottom of the point holder is “popped” from the end of the rods, and the probe rods are slowly removed from the boring until the bottom of the PRT holder is at a depth of approximately 12-inches above the base of the boring or any other sample interval prescribed in the scope of work. A shut-in test is them performed on the connection between the tubing and the Summa® canister to ensure that the tubing sample train and its connection to the canister is tight. At that point, a stainless steel PRT adapter equipped with nylon or Teflon® tubing is lowered inside the rods and reverse-threaded into place on the PRT holder. A bentonite putty seal is placed around the connection between the rods and the surface to prevent short-circuiting between the soil gas/soil vapor and the ambient air. With the PRT adapter and tubing in place, approximately 3 volumes of air is purged from the sampling point. Once the purging is completed, the canister is turned on to allow the test to run uninterrupted for the defined period of time. Alternative tightness testing can be completed or tedlar bag sample collection. Geoprobe® Direct Push tooling or other methods are utilized to clear the soils from a boring. Once the soils have been removed, a soil vapor implant is placed on the end of nylon or Teflon® tubing and lowered inside the hole. With the implant in-place, glass beads or 20/30 sand is emplaced inside the boring around the vapor implant until a sanded interval of approximately 12-inches is measured. With the sand in-place, bentonite crumbles are then placed inside the boring on top of the sand in 6-inch intervals hydrating along the way to the surface. With the bentonite in-place, the tubing is then capped, and the vapor implant is left undisturbed for a minimum of 24-hours prior to sampling. 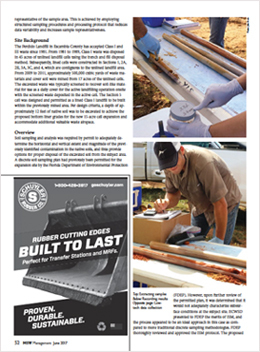 A shut-in test is performed on the connection above the top of the bentonite seal and up to the Summa® canister to ensure that the tubing sample train and its connection to the canister is tight. 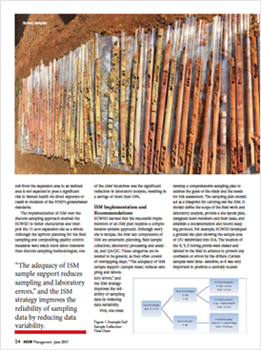 With the tightness testing complete, approximately 3 volumes of air is purged from the soil gas sampling point. Once the purging is completed, the canister is turned or the tedlar bag is filled to allow the test to be completed. To facilitate the collection of the sub-slab soil gas samples, a 5/8-inch pilot hole is drilled through the concrete surface to a depth of approximately 2 to 3 inches below the slab. Once the hole is drilled, a bottle brush is used to clean the concrete dust from the boring. With the hole brushed clean, a dry-vac is then utilized to clean the brushed and drilled cuttings from the surface. With the hole cleaned, a brass or stainless steel vapor pin equipped with a silicone sleeve is hammered into place within the drilled hole with a dead blow hammer. Once the vapor pin is set in place, ¼-inch outside diameter nylon or Teflon® tubing is connected to a Summa® Canister and a shut-in test is performed to test the tightness of the connection between the tubing and the canister. Once the connection with the canister tested tight, the ¼-inch tubing is inserted inside small-diameter silicone tubing and subsequently connected to the barbed fitting of the vapor pin. A PVC water dam is then placed around the pin, sealed to the surface with a bentonite putty, and filled with deionized water to check for leaks. Once no leaks in the surface connection are confirmed, approximately 3 volumes of soil vapor is purged from the location. Once the purging is completed, the canister is turned on or the tedlar bag is filled to allow the test to be completed. The Probing Company’s professional geologist staff is well versed in a variety of leak testing methods including: helium; isopropanol; shut-in tests; etc. Upon request, we can develop a leak testing procedure that fits your budget and site conditions. The Probing Company’s Professional Geologist staff is well versed various state specific methods and procedures for sampling and evaluating soil gas. Upon request, those methods can be tailored to a specific regulatory program. 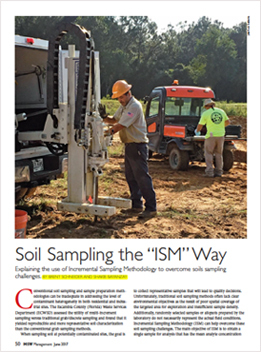 Explaining the use of Incremental Sampling Methodology to overcome soils sampling challenges.